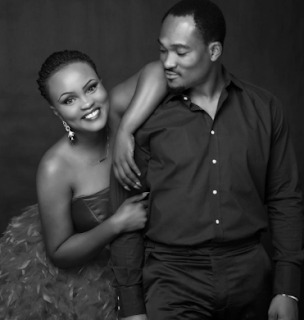 Nollywood Actor Blossom Chukwujekwu and his beautiful wife, Maureen, are celebrating their first wedding anniversary today October 15th. His wife, Maureen took to her IG page to share all the lessons she has learnt from her husband one year after they got married. "I once met an Aunty of B on my first Trip to meet his Parents officially. She looked at me and said in Igbo "I always wondered what the woman that would win the heart of this man would look like" and I asked why and she said also in Igbo "This Man U see here has the rarest and the best kind of heart, God combined the heart of his Mum and Dad and gave it to him. - I have learnt to have a longer temper even tho sometimes I still want to bring down the roof? Oh, I can go on and on cos it's a Very Long list. Am Amazed at how I got so Lucky. Happy Anniversary to Us Baby?? #1YearDown99ToGo??"